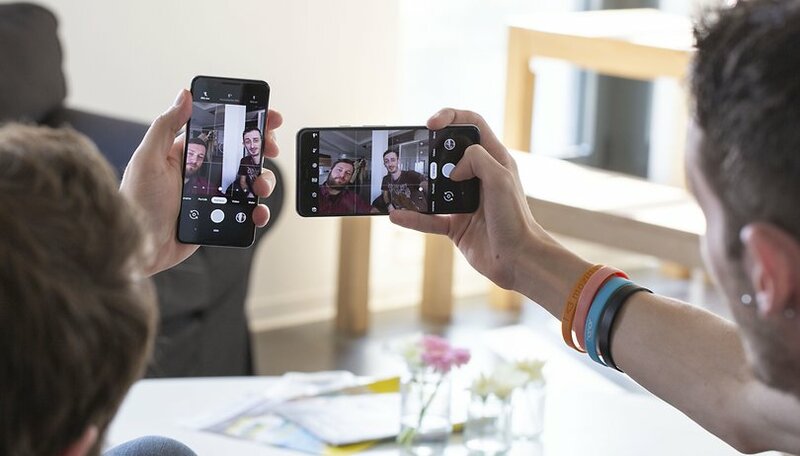 Google has started rolling out new features to its camera on Pixel 3 and Pixel 3 XL smartphones. One of the more interesting quirks is a kiss-detection system that allows lovers to take better selfies. The new feature, which comes with version 6.2 of the Pixel Camera app, is designed to solve the problem of having to hover your finger above the shutter when shooting pictures of your own face. The new shutter-free mode is called Photobooth. The feature allows selfie-loving couples to forget about the shutter button on concentrate on capturing the perfect snog. Photobooth will automatically take a photo when the camera is steady and it sees that the subjects have good expressions with their eyes open. Aside from detecting kissing scenes, the AI can also recognize smiles, tongue-out, kissy/duck face, puffy-cheeks, and surprise, according to an AI Google Blog. The technology is somewhat reminiscent of the now redundant Google Clips, which was meant to use AI to make taking photographs with your smartphone easier back in 2017. Once you click the shutter button in Photobooth mode, the app conducts a basic quality assessment based on the content score from the models. It will then filter out moments that either contain closed eyes, talking, motion blur, or when detecting the facial expressions or kissing actions has "failed". Photobooth then temporally analyzes the expression confidence values to detect their presence in the photo, which Google says makes it robust to variations in the output of machine learning (ML) models. Once the first stage is successfully completed, each frame is subjected to a more fine-grained analysis, which outputs an overall 'frame score'. Pixel 3: how to get your hands on the new camera app now! The frame score considers both facial expression quality and what Google is calling "the kiss score". Since a variable number of faces may be present in each frame, Photobooth applies an attention model using the detected expressions to iteratively compute which face is worth putting in the foreground and which should be left in the background. There's also an intelligence indicator, which you can see working in the GIF below. The white bar at the top of the image shows the selfie snapper what the current quality score is - essentially showing the photographer what the algorithms think of your shot. By moving your face, changing your expression or reposition your puckered lips, you can increase the length of the white bar, improving your 'score' until it reaches a sufficient level to trigger the shutter. The perfect photo is then captured and saved. That's how it works in theory, at least. Our colleagues over at The Verge experienced mixed results when they tested the feature. Google says in its blog post: "Photobooth is an example of how we can carve out a useful corner of this space—selfies and group selfies of smiles, funny faces, and kisses—and deliver a fun and useful experience." What do you think of the feature? Are you looking forward to getting some romantic shots with your significant other?